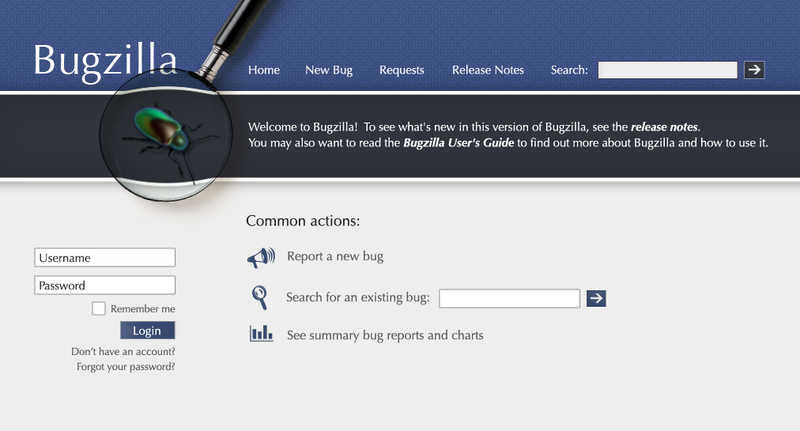 FWIW, I think we can depricate information about Bugzilla as a product in this home page, since most people are coming to Bugzilla to talk about Firefox or some other Mozilla product. The current “go to Bugzilla” experience doesn’t really differentiate between any of those purposes, and perhaps it should, as it’s where we send people who have trouble with Firefox. That’s really slick; I like it. You layout looks nice. As opposed to the current poroposed design which is almost worse than the current design. Couldn’t it just show the hottest (frequently dublicated/newest) bugs right on the frontpage close to the search box as bait to get people to search before filing. One problem I have with all of these front page designs is that none of them are IMMEDIATELY useful. They make it easier to find out how to get where I’m going, sure, but why can’t the front page be useful in and of itself? Show a brief list of new bugs, or random old bugs, or my newest bugs, or my oldest bugs, or recent changes to my bugs, or whatever. @Eevee: this page is currently designed for logged out users, not logged in users, so we cannot display *your* bugs. I like it a lot. About being more or less idiot-proof than the current design, I would say that if Boriss’ proposal is not idiot-proof enough, then I would prefer these idiot users to abstain from reporting an idiot bug, and I would be fine if these users are confused enough to not report the bug at all. I like it! Thinking of working on the patch asap, after I fix the blocker on 3.4 and the reviews I need to do. We’ll have to merge this with the header that ss came up with, but I like the direction, and a much better aesthetic. Very pretty! It looks incredibly inviting [to my untrained eye]. The only suggestion I have (and I had to strain to come up with one) is I think the search fields should contain the “Search” title within them, similar to how your username/password fields are shown. Alternatively, pull the username/password titles out of the respective fields. Just to keep some consistency, you know? I also like the suggestion of including the “hottest bugs” on the index. A top-ten listing under the common actions. Shouldn’t “search for existing bugs” be first, before “report a new bug”? Should “report a new bug” be disabled, with a note that it “requires login”? Looks much better for sure! One question though: does the main menu really have to be duplicated at the top and bottom of the page? I found myself scanning both menus and it took a few seconds before I realized they were showing the same items. Might be cleaner and less confusing to just have it at the top. I love your design idea. I really like the texture in the header, the fonts and the pleasing colors. It’s more like a piece of furniture than a web form. Is there any chance of your releasing a Bugzilla skin with this general feel to it? I’d love to use that over the skins presently available, which I’m not that fond of. It’s a shame that the aesthetics of projects like bugzilla get left out, I think your design would make it look professional while the current and new*ish* one make it look like a web designers first attempt. I don’t mean to be harsh, but I’m staring at the ugly right now and really there are so many talented graphics people out there. I think the biggest problem is not many of these talented graphics people are willing to take the time to redesign the WHOLE of Bugzilla as a concept visually. Instead they are willing to redesign a homepage, or a screen they dislike, but that tends to result in piecemeal looks. Jon Pink was the first visual designer to give us updates to the current homepage. So I guess what I’m saying is. Where are those many talented graphics people, please tell them to stand up and volunteer some well thought through UIs that cover the whole site. I’ve love to see some of those designs.